Geography and Destiny For centuries, scarce resources and difficult terrain have required people in the Hindu Kush region to develop unique solutions to survive. But while geography has brought challenges, it has also offered opportunities. In Afghanistan, geography is a multi-sided destiny. Identity and Perception Local, tribal, and religious identities in the Hindu Kush region have always shifted depending on one’s point of view. As Afghanistan decides what it means to be Afghan, it faces a kaleidoscope of moving perspectives. Tradition and Modernization Afghans have always had to be flexible. At times, this flexibility has brought people together, and at other times it has torn them apart. Reconciling tradition and modernization means making sense of what’s at stake when people change--and when they don’t. Traces and Narratives History is not always written. Much of what we know about Afghanistan comes from scattered artifacts, symbols, and oral traditions. Understanding these traces means piecing together the narratives that history leaves behind. Scroll through the timeline below to reveal events in selected theme (denoted by ). André. "WLANL - Andrevanb - Kist Uit De 27- 31e Dynastie (4)." Digital image. Wikipedia Commons. Accessed August 20, 2010. http://commons.wikimedia.org/wiki/File:WLANL_-_andrevanb_-_kist_uit_de_27-_31e_dynastie_%284%29.jpg. Drs2biz. "Silk from Mawangdui." Digital image. Wikipedia Commons. Accessed August 20, 2010. http://commons.wikimedia.org/wiki/File:Silk_from_Mawangdui.jpg. Dupree, Nancy. 61-321c. Dupree Collection, Williams Afghan Media Project, Williams College, Williamstown, MA. Han Dynasty Horses, Wall Painting. 2nd C. CE. Helingol, Inner Mongolia. Hsuan, Chang. Women Processing New Silk. Museum of Fine Arts Boston, Boston, MA. Jar with Two Handles. 50-75 AD. Corning Museum of Glass, Corning, New York. "Muxaworek Mukam." In Instrumental Music Of The Uighurs. King Record, 1991, CD. "PazyrikHorseman." Digital image. Wikipedia Commons. Accessed August 20, 2010. http://commons.wikimedia.org/wiki/File:PazyrikHorseman.JPG. PericlesofAthens. "Bronze Horse with Lead Saddle, Han Dynasty." Digital image. Wikipedia Commons. Accessed August 20, 2010. http://commons.wikimedia.org/wiki/File:Bronze_horse_with_lead_saddle,_Han_Dynasty.jpg. Pericles of Athens. "Chinese Silk, 4th Century BC." Digital image. Wikipedia Commons. Accessed August 20, 2010. http://commons.wikimedia.org/wiki/File:Chinese_silk,_4th_Century_BC.JPG. Photograph of Tomb Wall Painting Featuring a Khitan Horseman and His Steed. Inner Mongolian Museum, Hohhot. Thomson, W. M. "Silkworm Cocoon Purchasing in Antioch, 1886." Digital image. Wikipedia Commons. 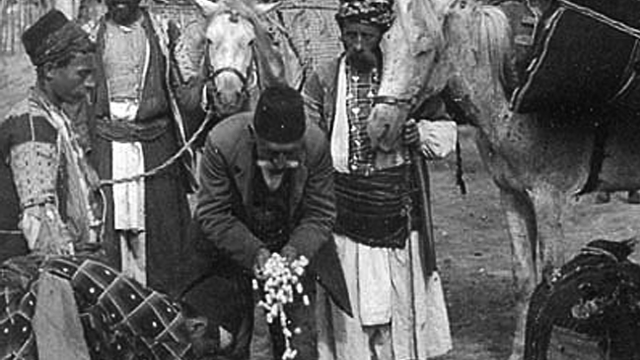 Accessed August 20, 2010. http://commons.wikimedia.org/wiki/File:Silkworm_Cocoon_purchasing_in_Antioch.jpg. "Urumqi Warrior." Digital image. Wikipedia Commons. Accessed August 20, 2010. http://commons.wikimedia.org/wiki/File:UrumqiWarrior.jpg. Vassil. Roman Glass, Found in Afghanistan. "Woven Silk, Syria, 780-900 AD." Digital image. Victoria and Albert Museum. Accessed August 20, 2010. http://collections.vam.ac.uk/item/O93132/woven-silk/. A piece of silk adorned the hair of a mummified Egyptian. She was a noble woman who lived some 3,000 years ago. Silk had its secrets. It’s believed that no one outside of China knew how to create silk. Did the silk come from China? How did it get to Africa? Archaeologists, historians, and linguists believe that humans on the vast Eurasian continent had traded for millennia, but little is known about their connections. For the first time, around the third century BCE, significant historical evidence showed that there was an intercontinental highway that linked the Roman, Persian, and Chinese empires—and by extension throughout the Mediterranean and into Africa. Soldiers, traders and monks—along with their goods and ideas—passed through deserts, plains, and the mighty Hindu Kush mountain passes. Although there had been trade before the 2nd century BCE, the Silk Road trade really originated in that time period. And these road would flourish because of a particular interest the Chinese began to develop in other parts of the world. It originated as a result of the travels of a Chinese ambassador to central Asia who brought back reports of spectacular horses in central Asia, one of the few products that the Chinese needed while simultaneously providing silk to the central Asian rulers. But the Silk Road trade was not just for Emperors and Shahs. The Silk Road trade is somewhat of a misnomer because there were lots of other products that were sent across Eurasia, one of them being Roman glass around the 3rd century BCE. Silver artifacts from Iran were also part of the trade that went back and forth. Herbs, spices, the idea of the grape and the walnut, all of those came from Iran to China. But these routes were for more than just the simple exchange of goods. Nobody absolutely needed silk or glass or anything of the sort. Much more important was the Silk Road brought cultures in touch with each other and resulted in a great deal of cultural and artistic diffusion. To understand society and prosperity in Central Asia, one could look to the great cities at either end of the trade routes. For the Silk Road trade to be sustained, there were two major civilizations that had to be at their height: China and Persia. If either one of those civilizations declined, then the Silk Road trade dwindled in large part because the two civilizations could protect the caravans as they were going across Asia. The Silk Road trade could also not have survived without the intermediaries, people in central Asia and Afghanistan who transported the goods, who acted as brokers for these products, and who knew the routes across these treacherous domains. Some of the most daunting desserts in the world had to be traversed. Some of the loftiest mountains in the world had to be traversed. It was precisely the nomadic pastoral peoples and the settled peoples of Afghanistan in central Asia who knew those routes and who facilitated travels across Eurasia. Throughout the centuries, travelers created a web of caravan tracks through the Eurasian continent, weaving together different traditions to form a rich tapestry across the Hindu Kush region. It was the locals who could navigate the treacherous mountains and deserts that connected China to Rome—and beyond.